A registered agent is your company’s official contact person and is required for every registered business in every state. Most states don’t allow your LLC to serve as its own agent, but you can personally serve if you meet state requirements. It’s best, however, to choose a third party who’s always available to receive important documents. Luckily, Rocket Lawyer offers a registered agent service as an a la carte service or as an add-on to their LLC formation services. For just $149/year Rocket Lawyer will serve as your registered agent and save you the stress of choosing an agent or serving as one on behalf of your business. All states require LLCs, partnerships, and corporations organized within the state to have a registered agent (RA). Some states allow your LLC to be its own RA, but most require someone other than the LLC to serve. The office of each state’s Secretary of State specifies whether a third-party registered agent is required. If a third-party agent is not legally required by your state, you, a friend, or a family member may serve in this role, provided you or they meet your state’s requirements for being an RA. This can represent a cost saving, but acting as your business’ RA personally or having a close connection perform this service eliminates many of the safeguards provided by registered agents. An RA reduces the likelihood of missing important filing deadlines and facilitates service of process to keep you from being served a summons in front of clients and employees. Third-party registered agents are ideal RAs if you want to protect your personal contact information, eliminate the threat of being served legal complaints in front of customers, and reduce the risk you might miss important correspondence. You can serve as your business’ registered agent (RA) for free or hire an RA service online for $50 – $300/year. In addition to receiving important mail from the state, RA services track important tax filings, reporting, and compliance deadlines, ensuring your business meets regulatory requirements. RAs also receive a summons and other court documents. Generally, a registered agent can be anyone older than 18 with a physical address in your business’ filing state and able to accept mail during normal business hours. You can serve as your LLC’s registered agent, select an acquaintance, or hire a service. We recommend hiring reputable statutory agent services to meet your state’s requirements. Rocket Lawyer is an online legal services platform that provides everything from LLC formation documents to operating agreements, registered agent services, and compliance assistance. Rocket Lawyer’s registered agent service costs $149/year and is great for businesses that want one company to help with setting up and operating their LLC. Try Rocket Lawyer if you need help with other parts of filing your LLC or corporation and want a one-stop legal service provider. Northwest is the third-largest registered agent service in the United States, and offers one year of registered agent services for $124. Northwest provides real-time delivery by scanning all of your correspondence and sending it to your business at no additional charge. The service also provides annual report reminders and compliance notifications. Check out Northwest if you want instant access to all of your important business correspondence. IncFile is a statutory agent service that can provide your business with a registered agent for $119.00 per year. Like other RA services, IncFile forwards official legal and tax correspondence from the state to your contact address and notifies you via telephone and/or email upon receipt of service of process. IncFile stands out from other providers because they provide the first year of registered agent services for free. InCorp offers the most affordable registered agent services of many providers, with prices starting at $66.56/year for a five-year contract. In addition to low prices, InCorp features EntityWatch®, a proprietary technology that syncs with state databases to monitor the status of your business and avoid corporate identity theft. Check out InCorp if you’ll need a statutory agent for several years and can take advantage of the multi-year savings plan. Registered agent requirements vary by state. In general, a registered agent must be an adult individual who has a physical address within the state and is available to accept documents during normal business hours, Monday through Friday. Some states, like Virginia, have additional requirements, like being an attorney or member of the business entity’s management. Resident individual – A statutory agent must be an individual who is a resident of the state where your business entity is registered or an in-state corporation. Physical Address – Your registered agent must also have a physical address within your state of incorporation. A P.O. box does not qualify as an in-state address. Some states require you to designate a “Registered Office” in addition to naming a registered agent, so check with your Secretary of State’s office to make sure you understand the requirements. Normal Business Hours – Your business’ registered agent must be available to accept mail and other documents on your behalf during “normal” business hours: 9 a.m. to 5 p.m., Monday through Friday. Registered agent services act as a business’ official, registered point-of-contact for correspondence with the business’ state of organization. The agent’s contact information replaces the business’ and gives people a place to send important correspondence. This provides your business with a reliable place to receive mail without sharing personal information or risking missed mail or deadlines. Once you assign a statutory agent, the agent will receive important documents like tax bills or summons. Upon receipt of tax bills, filing reminders, or regulatory correspondence, the service will forward the mail to your preferred mailing address and inform you of important deadlines. A registered agent service will also notify you immediately if they receive service of process on your business’ behalf. 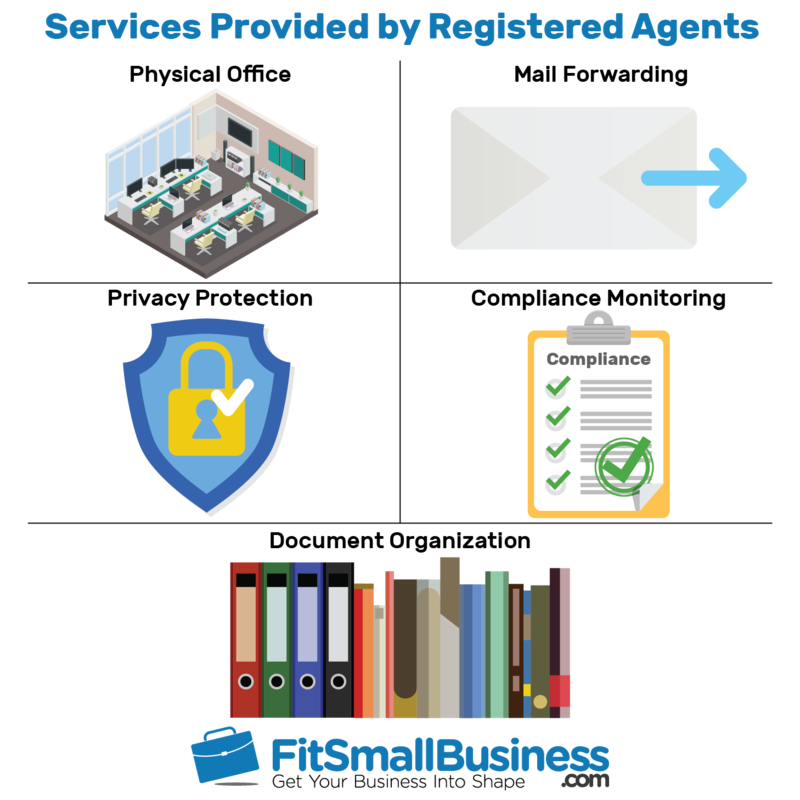 Registered agent services serve as an intermediary between your business and the outside world. For that reason, you can use them to keep your personal mailing address private, keep track of important filing and reporting deadlines, and make sure you never misplace important documents and correspondence. To help keep your personal contact information private and ensure you receive important state and court documents, choose a third-party registered agent servant instead of serving as your own RA. Rocket Lawyer offers registered agent services starting at $149/year, so you don’t have to worry about when you’re in the office and whether you’re keeping track of important tax, legal, and regulatory documents. All states require businesses filed with the Secretary of State to have a registered agent (RA). You may serve as your business’ RA to avoid the costs of hiring one, but RA services provide reliable agents, privacy, and peace of mind. We recommend hiring a registered agent service if you can afford the additional cost. Reliable – Hiring a third-party registered agent service means your business will always receive important documents in a timely fashion. Private – Statutory agent services are a great option if you work from home or have other reasons for not making your business address or other contact information public. Having a registered agent to receive service of legal process can also eliminate the risk of embarrassing interactions, like getting served a summons in front of potential clients. Flexible – A registered agent service can allow you to operate a business in a state where you do not have a physical address during normal business hours. This is helpful for businesses that are largely online or that travel around (e.g., a food truck). Expensive – Hiring a registered agent service costs more than doing it yourself or having a friend or family member serve as your agent. Requires additional paperwork – Using a statutory agent service requires you to sign up and pay for a service. This may seem intimidating, but services like Rocket Lawyer make it easy to hire an agent for your small business. Registered agent requirements vary by state, but it generally must be a person 18+ years old with a physical address in the LLC filing state. Your statutory agent must be available at that address during normal business hours. You can hire a registered agent service or identify a friend or family member who meets the requirements. As the organizer of an LLC, you may assign yourself the role of registered agent for your business if you have a physical address in the filing state. However, with the exception of a few states, you may not name your LLC as its own registered agent. Regardless of your state’s requirements, it is always best to choose a reliable third party to act as your registered agent. Can the Organizer of an LLC be the Registered Agent? The organizer of an LLC can be the registered agent if they have a physical address within the state and someone can accept mail at that address during normal business hours. We recommend hiring a registered agent service to prevent problems with lost mail, inconsistent business hours, or other issues that might result in failed delivery. Can a UPS Store Be a Registered Agent? A UPS store cannot be a registered agent. Registered agents must have a physical address in the state where your business is organized. In addition, someone must be available to accept mail during regular business hours. Because of these requirements, a P.O. box or rented box at a UPS store isn’t an acceptable registered agent. A registered agent is your business’ primary contact person who is registered with your filing state. Statutory agent requirements are state-specific, but you should choose a business or individual with a physical address in your state who is available to accept deliveries during normal business hours. Hire a third-party agent so you always receive important correspondence. If you don’t want to serve as your business’ statutory agent, check out Rocket Lawyer’s registered agent service. For just $149/year, Rocket Lawyer will act as your company’s point of contact with the state and provide email notifications when you receive important correspondence. They can also handle many of your business’ other legal matters, like drafting articles of organization and more.